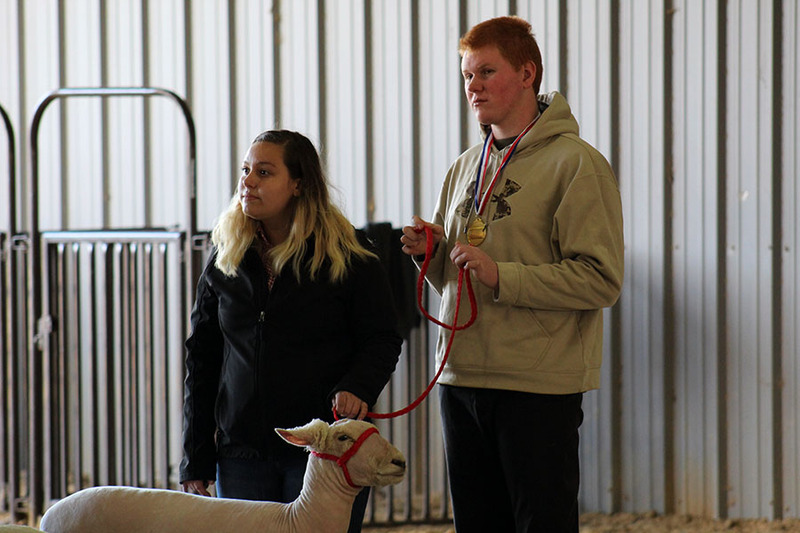 Marcus High School Circle of Friends member junior Ryan Turner receives a first-place award for showing a goat alongside his showing partner, Marcus FFA member senior Cassandra Soriano and her lamb, Barbra Ann. A Future Farmers of America (FFA) member walks into the barn and is instantly met with the sounds of pigs squealing. He makes his way to the pig pen where he sees six piglets roaming around their pens. Bartts opens the pen and guides the pigs outside to give them their daily walks. As he walks the pigs, Barrts feels a strong sense of compassion and attachment for these six little pigs. Junior Dyllan Bartts joined the organization while he was a sophomore and ever since then, his love for FFA has only grown. With a large interest in farm animals and agriculture, it wasn’t long before he became accustomed to farm work associated with FFA. When Bartts first presented his pigs at talent shows or market events to sell them at an auction, he was filled with anxiety but his family helped him through his first presentation. The FFA members take care of a wide range of animals including lambs, heifers and pigs. FFA adviser Sydney Wallace helps her students by teaching them the basics on maintaining their animals properly. Bartts isn’t the only member taking care of farm animals during his freetime. FFA member senior Noah Koscelnik takes care of pigs like Bartts and spends his free time making sure the animals are cared for. The end goal for all of the farm animals is for the members to show them off at an auction and make a sale. This helps the students learn communication skills as well as agriculture from a business standpoint. When Bartts was told he would have to sell his pigs on the market to be slaughtered, he was upset but knew it was for the best for the community. Members of the Marcus High School FFA chapter teach their Marcus Circle of Friends buddies how to show a goat. While Bartts is hesitant to see his pigs being sold to a butcher, but he knows what he has to do for the community as an FFA member. Adrenaline floods her body, sending rushes of excitement, fear and nervousness to her brain as her name is announced. Two months of long hours at the barn and extensive preparation have led up to the first time senior Honor Nelson will ever show her lamb, Buddy, in front of a judge. With a deep breath, she strides into the show ring with confidence, her lamb trotting happily by her side. A look of determination flashes across her face as she leads her lamb through the line of other showers in her class. After what feels like an endless amount of time in the ring, the judges announce the winners. Nelson takes home first in her class, first in her breed and the Reserve Champion overall award. Although this is Nelson’s first year in FFA, her passion and dedication has shown through her performance in the ring. At the Winter Buckle Holiday Classic on Saturday, Dec. 8, 2018, Nelson showed Buddy for the first time, taking home multiple awards. Nelson takes pride in her showmanship and enjoys the feeling of accomplishment she receives when winning an award, like she did at the Winter Buckle. The long hours Nelson spends at the barn with Buddy have resulted in high achievements for the pair. The FFA advisers see and admire Nelson’s efforts to improve her performance skills. They applaud the time she spends outside of school because it truly makes a difference in how her animal performs. 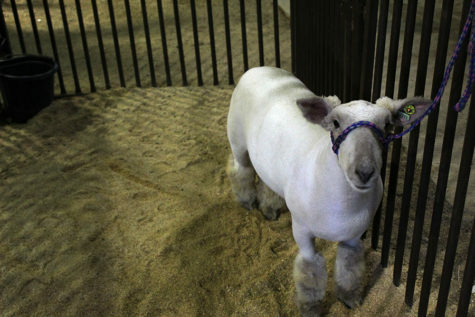 Senior Honor Nelson’s lamb, Buddy, stands in his pen. The bond between a show animal and its owner is strengthened by the extensive time put into perfecting the performances together. Although a lamb may not be a traditional pet, the way their relationship functions is similar to the relationship a house pet has with its owner. Wallace believes in encouraging her students while they pursue their goals. 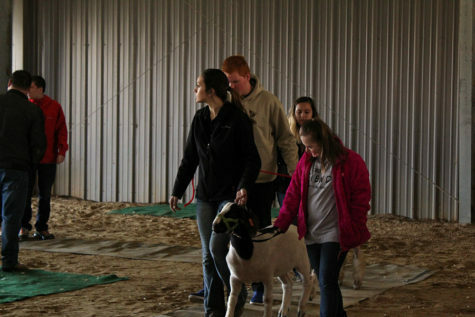 Although the students can achieve high goals on their own, the FFA advisers serve to reassure their students and enable them to perform to the best of their abilities with pride in the animal they’ve raised. At the community night on Saturday, Feb. 23, Nelson and her classmates demonstrated to the community what they do for an extracurricular activity. They also showcased their efforts to friends and family throughout the day. FFA students’ efforts are evident when they show their animal in the ring. Their showmanship comes as a result of working their animal over long periods of time at the barn. Slowly, she opens a gate and ushers the pig inside the pen. There, her eyes survey the barn to see if any other animals need her attention. When she knows the animals are good, she is ready to relax after a long day of hard work. Junior Briauna Gutierrez has been a member of FFA for two years and her main focus is to take care of swines because she has more knowledge on taking care of them than any other animal. 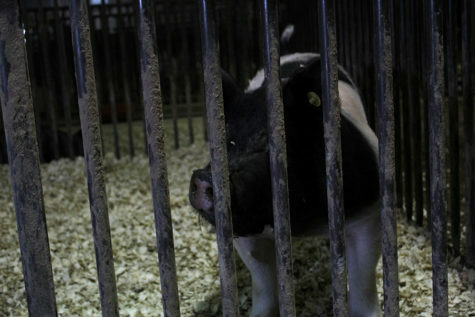 Junior Briauna Gutierrez’ pig, Chapo, stands in his pen. Gutierrez also teaches the pigs how to walk and act so they can act properly when they are shown. By doing so, the possibility of someone buying the pig increases. The process of selling the animals includes an auction where people place bids to purchase her livestock. FFA adviser Ashley Riley has formed a bond with Gutierrez and has helped her in the program. During her time in FFA, Riley helps Gutierrez in agricultural science and guides her in her studies as well. Junior FFA member Dylan Bartts helps Gutierrez by providing her a hand with caring for her animals. Bartts and Gutierrez met through FFA and have formed a strong friendship during their time in the program. By joining FFA, Gutierrez’ passion for caring for animals has grown. She’s learned how to take care of animals and how to handle them more efficiently. This story was originally published on Farmers’ Harvest on February 27, 2019.